MOSCOW (AP) Banned by FIFA, Sepp Blatter was back at the World Cup on Tuesday expecting to see two games and hopefully Russian President Vladimir Putin. The former FIFA president landed in Moscow to fulfil a two-year-old invitation from the host nation’s leader. Both did essential work to help ensure Russia won the tournament hosting rights eight years ago. ”But I am a guest. I take the program they are offering to me, and I am happy to be here,” he said. 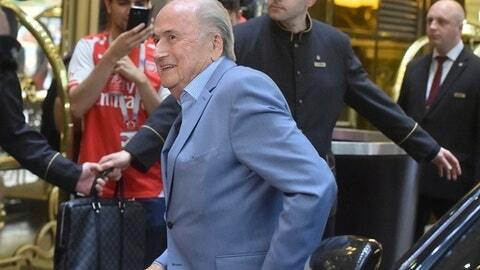 Blatter posed for photographs with fans from Mexico and Portugal on arriving at his downtown base after flying from Zurich. The one-time globe-trotting football leader, with a famed capacity to defy jet lag, has rarely flown in recent years since American and Swiss investigators unsealed sweeping investigations in May 2015 of corruption and bribery linked to international soccer and marketing officials, including some FIFA vice presidents. He announced his intention to resign days later. The 82-year-old Blatter is banned from official football duty until October 2021 for financial misconduct during this 17-year rule. But the FIFA ban doesn’t prevent him from attending games and he’s expected to see Portugal play Morocco on Wednesday at Luzhniki Stadium. He plans to see Brazil play in St. Petersburg on Friday. ”Then the next day (Thursday) I will travel to see Costa Rica beat your country,” Blatter joked to a Brazilian reporter. He is traveling with his partner Linda Barras on his first public appearance outside his native Switzerland since July 2015 when the World Cup qualifying draw was conducted in St. Petersburg. Blatter shared the draw ceremony stage that day with Putin and could meet with the Russian leader this week. Blatter voted for Russia to host the World Cup when it won a four-candidate contest in December 2010. As FIFA’s CEO-general secretary, Blatter oversaw preparations for each World Cup from 1982 to 1998. He was elected FIFA president on the eve of the 1998 World Cup in France, and headed football’s world governing body for four more tournaments through 2014. A Swiss criminal proceeding was opened against Blatter in September 2015 for alleged financial misconduct, but no charges have been filed. Using allegations from that case, FIFA’s ethics committee opened its own inquiry and banned him for eight years. It was reduced to six by FIFA’s appeals panel. His presence in Moscow can be an awkward distraction for FIFA and its new president, Gianni Infantino, who comes from a neighboring town in the same Swiss canon (state) as his predecessor. Blatter remains an instantly recognizable, if often polarizing, figure to generations of football fans.